Hearings this week will increase the pressure for the company to explain how bots and fake news exploited its network — beyond a narrow focus on political ads. 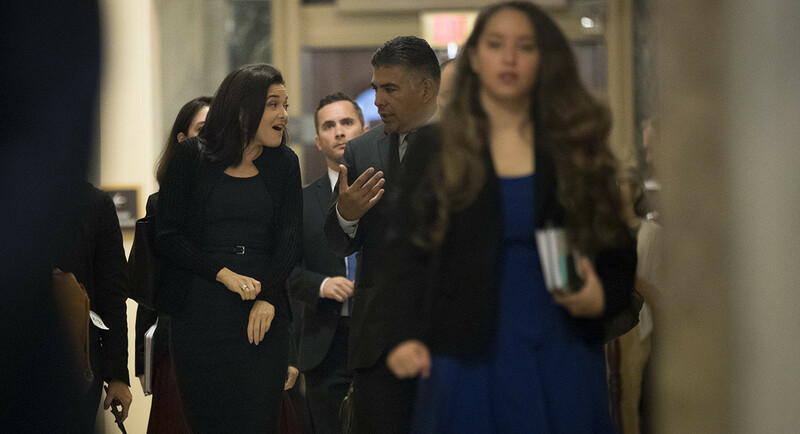 Sheryl Sandberg, chief operating officer of Facebook, walks with Rep. Tony Cardenas to a meeting with members of the Congressional Black Caucus, at the Capitol on Oct. 12. Facebook has been happy to keep congressional investigators focused on the Russian-bought online ads that helped sway voters in last year’s election — despite the many other ways that fake messages and bogus accounts spread on the dark side of social media. But that may be about to end: Facebook, Twitter and Google are preparing for hearings this week at which lawmakers are expected to grill the companies about the broad reach that foreign actors achieved through fake accounts and deliberate misinformation, a topic that encompasses far more than the 3,000 paid political ads that Facebook disclosed last month. Some lawmakers are already pressing for more details about so-called organic content, including unpaid posts from thousands of fake, automated and hijacked user accounts. Those questions could require Facebook to divulge more details about the priceless proprietary algorithms it uses to decide what messages its users see. Top Senate Judiciary Committee Democrat Dianne Feinstein asked Facebook CEO Mark Zuckerberg on Friday for a wealth of additional data about Russian activity on its networks, including all organic content and ads "targeted to any part of the United States" by any users who "may be connected in some way to Russia." The California senator also sent an extensive data request to Twitter CEO Jack Dorsey. Rep. Frank Pallone of New Jersey, the top Democrat on the House Energy and Commerce Committee, similarly requested a meeting with Google, Facebook and Twitter to discuss both their advertising and broader content management policies. In a letter, Pallone said their platforms have become increasingly powerful and the companies have taken on a "quasi-governmental role" in determining what content is appropriate. Ads are the "easier problem" to solve, a source close to the Senate probes told POLITICO. Spotlighting paid ads benefits Facebook because it limits the discussion to a relatively small slice of the possible malicious activity that Russia is believed to have engaged in on social media platforms, said a second source, a former Senate staffer who spoke on condition of anonymity to discuss the ongoing investigation. "I keep learning about how extensive this ecosystem is and the interrelationship between paid ads, fake accounts, the ability of the bots to push traffic," Sen. Mark Warner of Virginia, the top Democrat on the Senate Intelligence Committee, told reporters Thursday. Warner also indicated that regulations will be necessary to address the problem. "The notion of self-policing alone, I just don't think that's it, because it would simply move the bad actors onto sites that aren't," he said. Representatives of all three companies are due to testify at a Senate Judiciary hearing Tuesday on "Russian disinformation online," and at separate House and Senate intelligence committee hearings Wednesday on social media, Russia and the election. As part of its playbook for shaping the narrative of the Russia probes, Facebook focused on the issue of online advertising when it met with representatives of the Senate intelligence panel, according to a source close to the investigation, who spoke on condition of anonymity to discuss the inquiry. The former Senate aide also described a broader perception on Capitol Hill that tech companies are steering the discussion toward ads. Facebook offered a glimpse at seven problematic ads during a private Hill briefing last month and, after pressure from lawmakers, agreed to turn over 3,000 of them to investigators. It separately disclosed to the public that the Russia-linked ads cost about $100,000, a figure that drew widespread media attention. Twitter then followed its lead and presented some similar information to lawmakers' offices. Both companies have since announced internal plans to require greater oversight of political and issues-based ads — pre-emptive strikes that could blunt recently introduced legislation to force greater disclosure. And Twitter announced Thursday that it was dropping all ads from Kremlin-funded English-language media outlets RT and Sputnik. But advertising is just one part of the far-reaching Russian influence campaign that the probe has documented so far — one that also included hacking the Democratic National Committee and Hillary Clinton’s campaign, along with shaping public discourse through fake news stories targeted at impressionable Americans. While Congress’ legislative response so far has consisted of bills targeting social media ads, this week's hearings will provide an opportunity for lawmakers to press beyond ads for the first time in a public forum. Facebook, Google — which owns YouTube — and Twitter will probably face questions about why their platforms seemed to so easily facilitate the spread of misinformation and what the companies are doing to prevent future election-meddling. "I got a lot of [questions], and I'm going to ask them all at the open hearing," Senate Intelligence Chairman Richard Burr (R-N.C.) said in a brief interview. He played coy on specifics. "I want to save it so it's a surprise for everybody." Other lawmakers said they plan to probe the dissemination of fake news, fake Facebook accounts that impersonated people or were actually bots, and the use of online trolls to promote divisive messages. One issue that could plague the company is the extent to which the Russian entities created fake organic content on both Facebook and Twitter and used those posts to sow chaos in the election and drive undecided potential voters away from Hillary Clinton and into the Donald Trump camp. Facebook has committed to giving material on organic content to the investigators. Is Trump more media-accessible than Obama? Can Germany Make an Unwieldy Coalition Work?